Polar is the perfect match of brains and looks, packing in a beautiful 2 inch color screen, an elegant prismatic appearance along with the featured Cascade Baby SE Sub-Ohm Tank. 0.001s Firing Speed brings you the most rapid and safe heating and the purest rich flavor from the first puff to the last! The upgraded OMNI Board 4.0 integrates Insta-Fire, Super Player Mode and multiple protections. 2.5A quick charge can halve your charging time. Polar is optimized for users looking for some serious power output with minimal fire delay. Experience instant vaping with Polar! 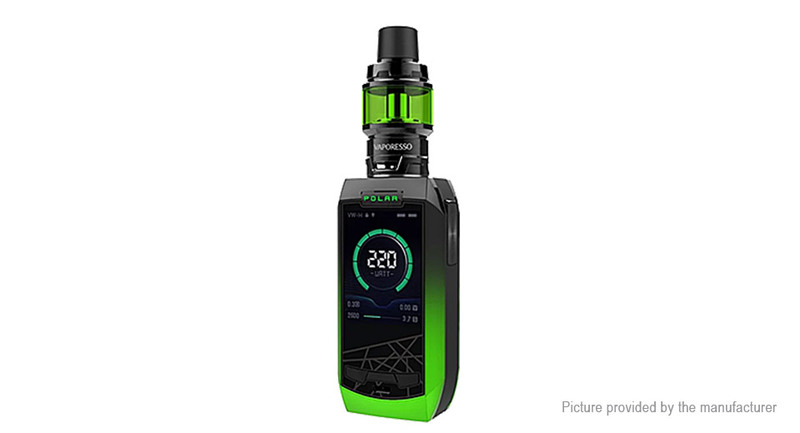 The Vaporesso Cascade Baby SE Sub Ohm Tank is the newest member of Vaporesso family, which features stylish look, 6.5ml juice capacity, slide-n-fill system, EUC plug-pull style coil change method. The GT Mesh coils will heat up evenly compared to regular coils. With its unique triangular air flow structure, the GT Mesh can enlarge the heating area, and the use of mesh offers great flavor. The first of its kind isolation structural design separates coil and juice vault allows consistent, intense flavor at every puff and also reduces leakage and potential dry hit in a way. Combo with balanced triangular adjustable bottom airflow, users will be surprised by how smooth, flavorful, massive cloud this tank can offer. The authentic Vaporesso Polar box mod is the perfect match of brains and looks, packing in a beautiful 2 inch color screen. The 0.001s Firing Speed brings you the most rapid and safe heating and the purest rich flavor from the first puff to the last! The upgraded OMNI Board 4.0 integrates Insta-Fire, It features multiple protections, such as overtime, low resistance, low power, short-circuit protection and so on. Powered by dual 18650 batteries (not included), the max output power can be up to 220W. The 2.5A quick charge can extremely halve your charging time to 1.5 hours. What&apos;s more, it supports Super Player Mode, Bypass Mode and Other Mode, such as VW (H/ N/ S), VT (SS, NI, TI), TCR (M1, M2) and CCT / CCW / VV / CCV Mode. Insta-fire,instant satisfaction: With the most rapid, stable yet safe firing rate of 0.001s, Insta-fire quick heating system brings you rich flavor and denser clouds within the very first puff.